Hagia Sophia, once described as the greatest church in Christendom, is certainly a masterpiece with a synthesis of the Occident and the Orient. Built by Constantine the Great in 325 on the remains of a pagan temple. Rebuilt by Justinian and Theodora. In 1453, Mehmet the Conqueror added minarets to the huge, soaring dome and turned the former church into a mosque. The building controversially became a museum in 1935, but the interior retains its religious associations with the Christian mosaics and Muslim calligraphic disks adorning its walls and piers. 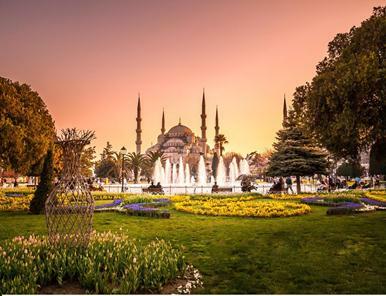 Blue Mosque, has a special place among the various Ottoman buildings constructed in the Sultanahmet Square. Constructed by Sedefkar Mehmet Aga who took classical Ottoman architecture and the Hagia Sophia into consideration in designing and construction of the Blue Mosque and created an interior space which is more spacious, well lighted and airy than the others. It is known as the Blue Mosque for the blue tiles adorning the walls of its interior. Hippodrome, a public park used in the days of the Byzantine Empire for ceremonies and sporting events(chariot races, athletics). Theodosius Obelisk, Serpentine Column, Column of Constantine and German Fountain of Wilhelm II are the monuments decorating Hippodrome. Grand Bazaar, is the oldest and biggest closed bazaar of the world. It was founded in 1461. 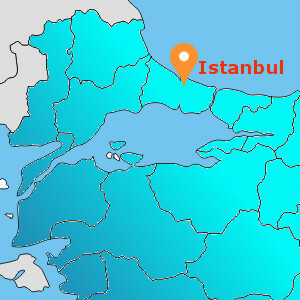 Like an enormous labyrinth, it is a spectacular and unique part of Istanbul with 60 streets and over 3600 stores. The Grand Bazaar offers a wide range of products from copper to glazed tiles, from marriage articles to ready wear, and from various handicrafts to all types of spice. Western writers often mention the Grand Bazaar in their memories and travel journals. Topkapı Palace, which had been the seat of government for the Ottoman Empire that ruled three continents for centuries, was constructed between the years of 1460 and 1478 during the reign of Sultan Mehmed II(The Conqueror). It was home to the sultans and their families until the reign of Sultan Abdülmecit. Therefore, it has a very rich collection of porcelains, robes, weapons, shields, armors, miniatures, Islamic calligraphic manuscripts as well as Ottoman treasures and jewellery. Tombs of the Sultans at Hagia Sophia, five sultans Mehmed III, Selim II, Murad III, Ibrahim I and Mustafa I rest in eternal splendor, teeming with overlooked beauty and drama. Closed : Hagia Sophia is closed on Monday , will be replaced by Underground Cistern . Topkapi Palace is closed on Tuesday, will be replaced by Beylerbeyi Palace . Grand Bazaar is closed on Sunday , will be replaced with local shop .